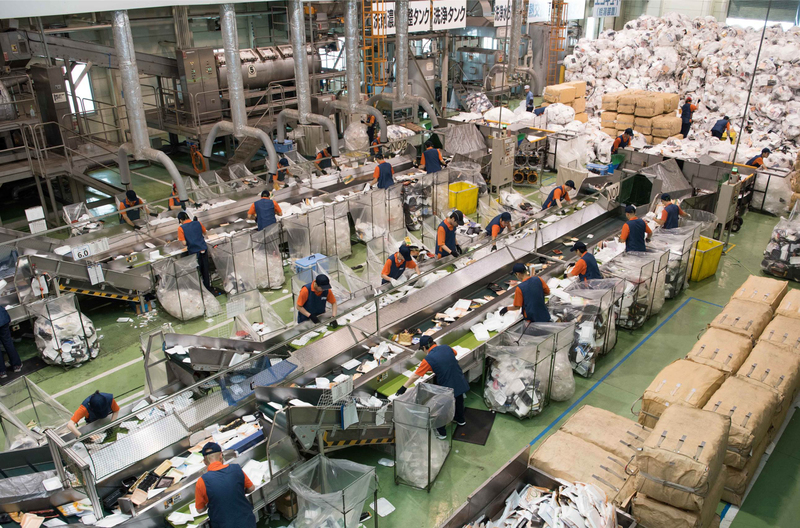 Workers with disabilities sorting foam food trays at FP Corp.'s Kanto Recycling Plant in Yachiyo, Ibaraki Prefecture. | FP CORP.
Environmental and social factors in particular are what leading food tray container manufacturer FP Corp. (FPCO) incorporates into its core business and daily operation among the much-talked-about ESG (environmental, social and governance) efforts. Many companies have struggled to find ways to integrate their businesses into said efforts amid increasing attention to ESG undertakings. However, some of those elements were already part of FPCO’s main businesses more than 25 years ago, and have served the company’s sustainability endeavors. In 1990, the firm started a system of collecting used food trays and using the recycled materials to create environmentally friendly products. This effort began as a “preventive measure” against the global trend of consumers boycotting environmentally harmful products following a massive boycott campaign in the U.S. against a fast-food chain’s use of disposable foam containers, according to the firm’s Environmental Management Division General Manager Eiji Togashi. “We started collecting the trays for recycling at six locations in Osaka and Hiroshima … we didn’t want to see them go to waste,” said Togashi, who pointed out the growing social attention on refuse-related issues at that time. He added that the number of collection locations has grown to some 9,200 as of March. The system the company, which is headquartered in both Fukuyama, Hiroshima Prefecture, and Tokyo, developed was “Tray to Tray” circular recycling. To further advance its circulating recycling effort, FPCO started collecting transparent trays for reuse in 2008, in addition to developing the “Bottle to Tray” system in 2010, which utilizes collected polyethylene terephthalate (PET) bottles to create recycled transparent “Eco APET” food trays. Togashi said these recycling efforts have contributed to the reduction of carbon dioxide. The Eco Tray and ECO APET successfully cut such emissions by 30 percent compared to creating trays with raw materials. Additionally, it has also helped reduce related expenses of about ¥66.4 billion, equivalent to around 2.65 million collection vehicles as of March, assuming such materials were disposed of as waste. FPCO’s recycling system seems to have worked smoothly, but Togashi said consumers’ cooperation is imperative. “This recycling system does not work unless consumers wash used materials, dry them and bring them all the way to store fronts,” he stressed. As part of its effort to deepen understanding of the recycling system and promote cooperation among consumers, FPCO accepts visitors for tours at its sorting centers and recycling plants. Togashi noted that about 20,000 people, including elementary school students, visit the facilities every year. 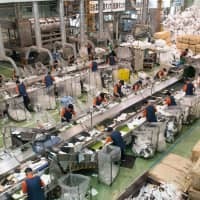 On the social front, FPCO started employing workers with disabilities in 1986 as the workforce for its recycling-oriented value creation business. The company employs 377 such workers as of March. These figures include those with severe disabilities who are counted as two persons based on a national act, bringing the official total to 649 workers. This has resulted in an employment rate of 13.8 percent for individuals with disabilities, much higher than the statutory rate of 2.2 percent for private companies. Such employees have engaged in the company’s operations, tasked with the work of sorting collected foam trays and manufacturing food containers; this requires a high level of concentration and technical skill. In a bid to encourage further communication among its workers, irrespective of disabilities, FPCO supports floor hockey, a universal sport enjoyed by many. Nearly 600 employees participate in floor hockey activities across 10 of the firm’s locations throughout the country. 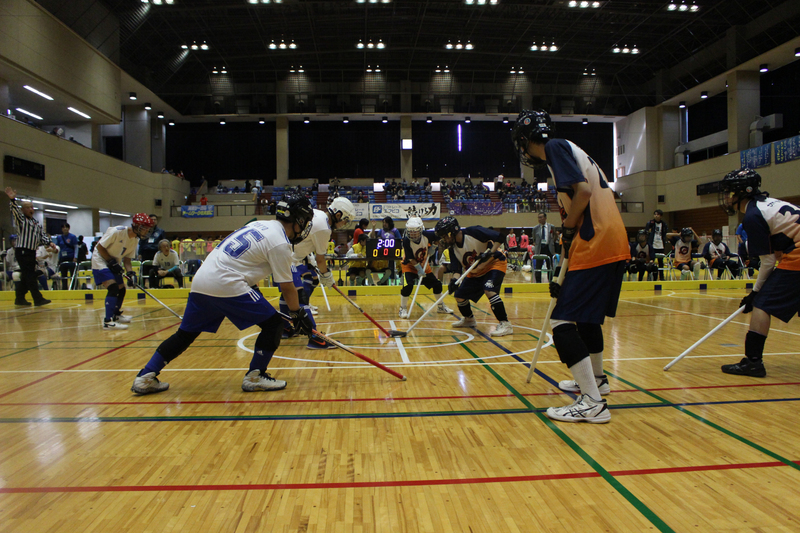 “A sense of unity is fostered through this sport, in which people, irrespective of disabilities, can play,” said Deputy Executive General Manager of General Affairs and Personnel Division Kimiko Nishimura. Since 2013, the company has sponsored a national floor hockey competition to help support and spread the sport further. 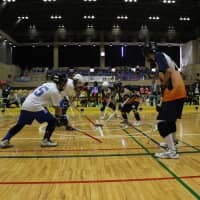 The latest event was held on Oct. 20 and 21 in Tokyo’s Katsuhika Ward, in which 27 teams took part, including five teams from FPCO and its group companies. About 90 FPCO employees also supported the event as volunteers. 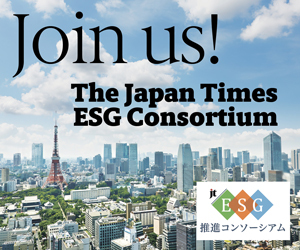 Nishimura said the firm expects participating employees to grow as individuals through engaging in the event’s operation, which would also hone their business potential.